If you’re looking for a way to change up your egg breakfast routine, add a spicy black bean burger and make a breakfast stack! My recipe from a few years ago is below and it IS delicious, but you can customize however you like! Lately, I’ve been creating easy gluten free meals and eating dairy free, so using a different brand for the patty and removing the cheese and sour cream does the trick. My blog posts contain affiliate links, which means I may earn money on purchases made. Sometimes you need to come up with a tasty and health-conscious recipe because you run out of oatmeal and the idea of pancakes (with sprinkles) wasn’t cutting it. Just me? Years ago I discovered a great breakfast at a local restaurant that I had never seen before. They called it huevos rancheros, but it had a spicy black bean burger at the bottom of the stack and it was delicious! I had some of the ingredients at home so I decided to recreate it. Since I already had the electric skillet out (see: pancakes) making this spicy black bean burger breakfast stack was easy! You could even use leftover hard boiled eggs to make it even faster. I’m a big fan of versatility and this is one you can really tailor to fit your needs whether you’re gluten free, dairy free on Weight Watchers or simply want something new in the mornings. For a good gluten free black bean burger option, try Gardein. They’re yummy! Making this recipe really couldn’t be easier but it makes such a difference! For someone who loves eggs, I still get bored after a while. If you’ve never added a spicy black bean burger to your eggs, try it! You may just find a new favorite. Make this delicious Spicy Black Bean Burger & Egg Breakfast to give your mornings a kick! 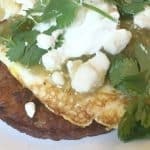 Layer black bean burger, egg, salsa, and feta cheese. Want more? I’ve tried out and shared many other family friendly recipes – including Avocado Deviled Eggs you must try! I never would have thought to use a black bean burger with eggs. This sounds soooooooo good. I must try this. wow thank you for the recipes this looks so good! That looks delicious. I am always looking for healthy and low cal/fat options. I am a long time Weight Watchers fan, but I haven’t done it for several years. This would totally be a breakfast for me. 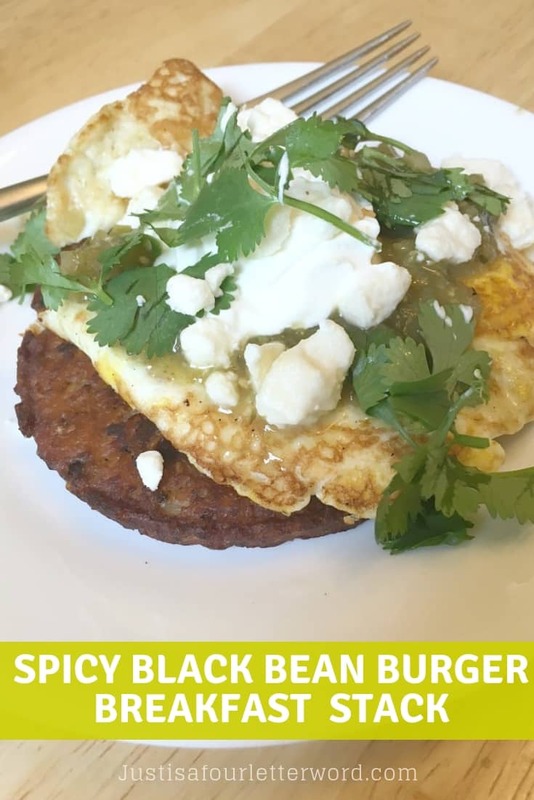 Your spicy black bean burger looks so delicious and I am surely going to try this out for my little children who love such dishes with eggs!